Bruce McKenzie in 10 out of 12. Photo by Julieta Cervantes. BOTTOM LINE: Anne Washburn and Les Waters take audiences inside the process of theater tech in their new play at Soho Rep. When you walk into the Soho Rep, you are handed a headset and soon transported into a tech rehearsal. (If you don’t know what “tech” is, it’s a process of adding technical elements like lighting and sound to a show, which usually means several very long days of sitting in a dark theater.) In 10 out of 12, you are sitting in on a tech of a play. The stage manager, crew, and designers are all on headsets, and thus in your ear, discussing their dinner. The director is in the house, as are the frazzled actors. 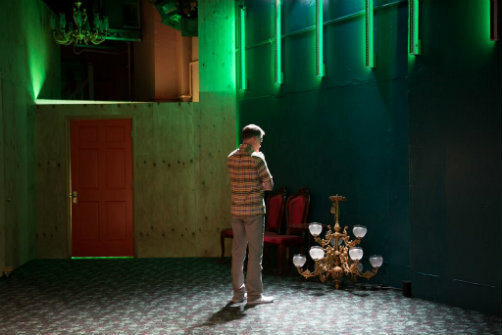 Sitting in on this fictitious tech is a cross between immersive and voyeuristic—the tech is not real time, the play is gratefully not 10 hours long (the title refers to the Actors’ Equity rule of 10 hours of work in a 12 hour day), and it is done in a proscenium, regardless of the clever staging. A play set in a tech rehearsal is clearly geared to a certain kind of audience—theater people. I imagine the show attracts a mostly theater-centric audience that thinks a tech rehearsal sounds like a fun setting for a show. And it is fun, particularly the first act. Anyone who has ever participated in putting up a show can laugh and relate to Elliot (the show-within-the-show's director, very realistically portrayed by Bruce McKenzie) and his rage at the red glowing Exit sign that is disrupting his vision. Another great director moment is when Elliot asks the sound designer if the effect could be “more tropically.” Other relatable moments include when the show-within-the-show's actors (Nina Hellman and Sue Jean Kim) struggle to enter narrow doors in their Victorian period hoop skirts, or when actors disappear from the building right when they are needed for a scene. Les Waters has done a wonderful job creating a realistic tech atmosphere, from the way the actors and scenic elements are placed, as well as the pace of the movements. The creative team should all be applauded for their role in the atmosphere as well: set is by David Zinn, sound by Bray Poor, lighting by Justin Townsend, costumes by Ásta Bennie Hostetter and props by George Hoffmann & Greg Kozatek. Off Broadway veteran Quincy Tyler Bernstein plays Molly the stage manager (who has a very soothing stage manager voice on headset); several other recognizable "downtown" actors are also in the cast. One of the show's actors, Paul (Thomas Jay Ryan), has several monologues which are played as a disembodied voice that I did not relate to at all, and I am unsure how they are meant to connect to either the unnamed play-within-the-play, or to 10 out of 12, a play about tech. I thoroughly enjoyed the inside jokes of the tech rehearsals, and found the first act to be funny and engaging. The play-within-the-play seems to be comically bad: several scenes focus on demonic imps. In Washburn’s script, we don’t get enough of the play to really understand the plot; at the same time, it’s almost too much, especially in the second act. Indeed, the tonal shift between the energetic first act and the second act, which drags, is jarring. I don’t think the text successfully draws everything together into a cohesive play. That is, 10 out of 12 attempts to bring together the technical aspects with the play-within-the-play, as well as answer the question: what does it all mean? But the desire in the second act to create a larger meaning and message doesn’t quite align with the light-hearted, insider-y theater play of the first act. The audience seemed completely in on the jokes at the performance I attended, but I have to wonder how 10 out of 12 would play to someone with less understanding of a tech rehearsal. Would it be enjoyable at all to someone without a theater background? Someone who doesn’t have any prior experience of a technical rehearsal? Anyone who has ever been involved in theater will appreciate 10 out of 12 but I’m not sure that this play is the right opportunity to contemplate the meaning of life in the theater.